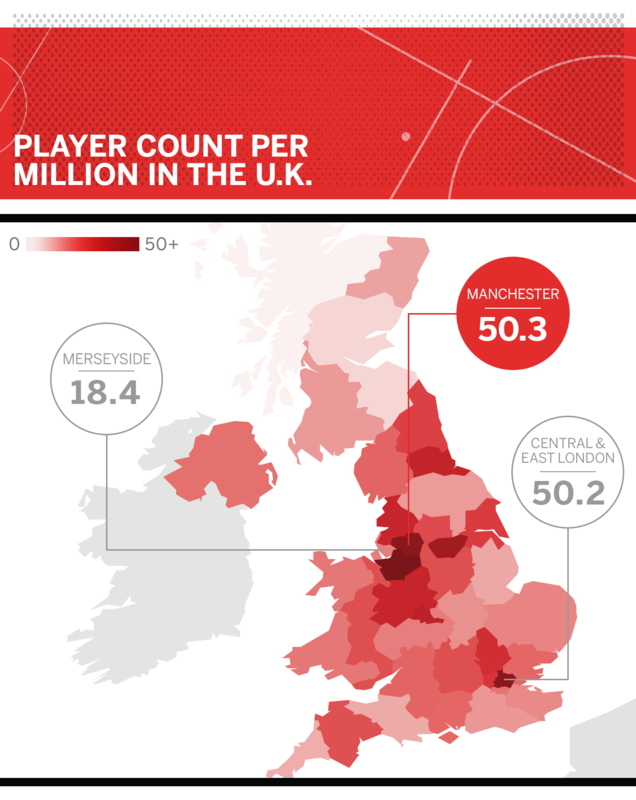 Football hot spots: Where do players come from? We took a stab at this huge topic by limiting our search to the countries of Europe's big five -- Premier League, Bundesliga, Serie A, La Liga and Ligue 1 -- and using a software tool that pulled in data. After that, we asked our country experts to tell us what the findings meant. While by no means comprehensive or conclusive, there were a few surprises. For example, while usual suspects London and Paris are strong, they cannot compete with the Basque Country and Navarra. And what gives, Liverpool and Turin? Data based on the second half of the 2017-18 season, i.e. once the January transfer window closed. The term "football hotbed" is often misused, but Merseyside is a region that has always ticked the box. There has traditionally been a production line of top players from the area, who have gone on to represent the area's clubs and England. Robbie Fowler, Steve McManaman, Steven Gerrard and Wayne Rooney are the most obvious examples during the Premier League era, but the emergence of Trent Alexander-Arnold at Liverpool is the first example of a local boy making the grade at Liverpool for a while, and the talent drought is a concern. Unlike London and Manchester, Liverpool is a relatively isolated city with perhaps an absence of clubs scouting from outside the area, leading to a smaller network of talent spotters. But nonetheless, it is underperforming compared to previous eras. The Football Association of Ireland has a long established youth development system, which has borne fruit for many years, but Ireland also benefits from strong connections with clubs in England and Scotland, who flood the island with scouts looking for the next George Best, Roy Keane, Damien Duff or Robbie Keane. It is also a country with a well-established sporting scene. Many youngsters play football and Gaelic sports, so from a young age, potential footballers are exposed to competition and an athletic lifestyle. All of the major cities in Ireland -- Dublin, Cork, Limerick, Belfast and Derry in the north -- perform better than many bigger cities in England and Scotland. The home of City and United is a fertile ground for the development of professionals, with every level of English football well-stocked. The south of the city slightly outperforms the north -- it has more affluent areas and is more densely-populated -- but the general advantage Manchester has is the number of professional clubs in and around the M60 motorway. From Rochdale, Bury and Oldham, through to City and United, it's hard for anyone to go unnoticed. Even Crewe, approximately 30 miles south, scout in the area and have picked up players. Many Manchester-born players find their way to the smaller clubs in the region after being released by United or City. South Yorkshire is on a par with Manchester, which is a surprise, considering the lack of success by Premier League clubs from the region in recent years. But there are lots of professional clubs, including United and Wednesday in Sheffield, as well as Barnsley and Doncaster Rovers. England defenders John Stones (Barnsley), Harry Maguire and Gary Cahill (both Sheffield) are current examples of the rich seam of players emerging. Barnsley, in particular, have a thriving academy that boasts Stones and Everton's Doncaster-born Mason Holgate as recent graduates. Middlesbrough seems to out-perform Newcastle and Sunderland, though there is a strong youth development culture at all three clubs. For example, Sunderland-born Jordan Henderson and Jordan Pickford, from nearby Washington, both emerged from the Sunderland Academy. As a relatively isolated area -- Leeds is the closest big city and an hour from Middlesbrough -- the three benefit from a thriving football culture and the necessity to produce their own talent to compete with wealthier clubs in the bigger cities. Johan Cruyff saw Basque players as vital as he built his "Dream Team" of the 1990s, and the number of players from this region suggests that ideal is still borne out. Look across Europe: Javi Martinez is a powerhouse for German champions Bayern Munich, and Ander Herrera was player of the year at Manchester United in 2016-17. Is that genetic inheritance of sporting mentality/physiology and a desire to use football to become wealthy and successful? Or is it that Athletic Bilbao's policy of recruiting only Basques means they have to invest more resources in local youth? Catalonia a hotbed? Think again! The relative underperformance from the home of Barcelona, as well as other top-flight clubs, is surprising and certainly out of sync with how they are viewed (and wish to be viewed). We are not so far removed from Tito Vilanova fielding an XI full of players brought up in Barcelona's academy, many of whom were Catalan. The regional identity in playing staff at Barca, Espanyol and Girona remains strong, and the Blaugrana, in particular, still push the idea that "Mes Que Un Club" has a part of its sentiment vested in "we produce homegrown Catalan kids." So this statistical return, in a region where facilities for young players -- from grass, to synthetic, indoor and street corners -- are top-class, is a surprise. 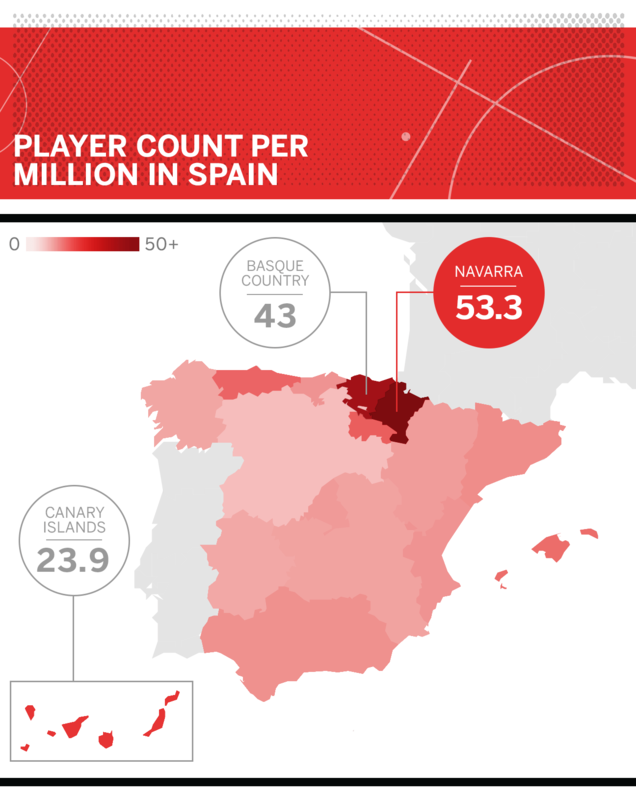 Of 116 players hailing from Andalusia, just five play abroad. Of 116 from Murcia, the number is four, while none of the 23 from Castilla-la-Mancha and 12 from Extremadura have moved overseas. That contrasts with 10/105 from Barcelona, 9/82 from Madrid and 6/36 from Navarra. It isn't easy to explain this trend; that is for a combination of sociologists, psychologists and Andalusian mothers! But remember how Jose Antonio Reyes struggled with life in London until he came home to Sevilla via Madrid? Remember the anxiety-based difficulties that dogged Jesus Navas' early professional years when he travelled far from his native Seville? He conquered those, but for this cluster of regions, home is where the heart is. In Galicia, A Coruna, a large urban area, produces about what you'd expect: a dominant percentage of the area's players. But Vigo, farther down Spain's west coast and home to a Liga club, seems to be a zero return. What gives? Is the presence of a successful, praised, attractive and famous club/era a direct motor to drive kids with potential into dedicating themselves sufficiently? It's a tempting idea, but is it provable? Maybe not, but it is reasonable that A Coruna enjoys the knock-on effect of having Spain's most attractive "other" team -- Deportivo -- during the late 1990s and early 2000s. Celta, by comparison, have a relatively modest history in terms of trophies and European fame. The Navarran people certainly are held to be proud, self-motivated, hard-working and not easily dissuaded from what they hold to be dear. Is this, truly, a strong enough concept to explain the disproportionate number of players from this area who achieve professional status? I'm not sure. Equally, if the factor of having a healthy, successful, top-flight team is a key, then fine, there were days when Osasuna shined their own light quite brightly, but they were intermittent and, sadly, long ago. Nearly 28 years after reunification, there are still huge economic differences between west and east in Germany. The nine Bundeslander (federal states) that made up the old West Germany -- Berlin excluded -- have an average gross domestic product of €41,085 per capita, whereas the five Lander on the Eastern side of the former wall averaged a GDP of €27,333 per capita, roughly 25 percent less (2017 data from Statistische Bundesamt). Less money equals fewer sponsors and wealthy benefactors for football teams, which is one of the reasons RB Leipzig, the club set up as a marketing vehicle by the soft drinks company in 2009, are the only side located in the former GDR to have made the top flight since 2008. In addition, the east's relative paucity acts like a brain drain, ensuring that the game's brightest coaches and administrators are drawn west. The Ruhr area, named after the river that runs through the southern section of this coal-bearing region, is a densely populated urban area combining a number of cities. It borders on the Rhine area, where big cities such as Cologne and Dusseldorf are located. Combined, the two regions are home to 12 million people. The heavy industry, which included mining and steel and attracted workers to the region in the 19th century, has largely gone, but the passion for football remains, alongside a wealth of expertise and history. Powerhouses such as Schalke 04, Bayer 04 Leverkusen, Borussia Monchengladbach and Borussia Dortmund, as well as Cologne, Fortuna Dusseldorf, Bochum, Duisburg and Fortuna Cologne, all battle to attract local talent and create a hothouse in which young players from diverse backgrounds can blossom. With a GDP of €44,225 per capita, Bavaria is the wealthiest federal state -- the city state of Hamburg excluded. What used to be a predominantly agrarian region has been transformed by newer industries such as electronics, cars, engineering and chemicals. Bavaria is one of the less densely populated areas in Germany, but the enormous resources available in metropolitan centres such as Munich and its suburbs, as well as Nurnberg, help clubs develop talent. The geographical proximity to Switzerland, Austria, Northern Italy and the Balkans is another factor in Bayern's favour. There's a wealth of expertise that can be tapped on their doorstep. As city states, Hamburg and Bremen monopolise industry and football in the north. As a result, Schleswig-Holstein, the northernmost region, is the least economically powerful of the western states in terms of GDP per capita. In Holstein Kiel, the area might gain another Bundesliga club to offset Hamburg's relegation, but there aren't many big cities with footballing traditions. Wolfsburg and Eintracht Braunschweig, based in Lower Saxony to the south, fill the gap to a certain extent, but it seems that the lack of financial firepower and expertise directly based in the north has had a negative effect on player development. The city of Trier on the banks of the river Moselle, close to Luxembourg, is a black spot for Bundesliga players. The most logical explanation for this statistical quirk would seem to be the absence of a big football club capable of honing talent. Eintracht Trier are a fifth-division outfit of amateurs, and the club has no state-of-the-art facilities or coaches to develop players. Geography might also play a part: Trier is surrounded by hills with vineyards and two low mountain ranges, which put space for football pitches at a premium. Juventus are the biggest and wealthiest club in Italy, and Torino, historically, have had one of the best academies. Yet the Piedmont region contributes very few players, particularly when you consider that in terms of GDP and infrastructure, it's similar to neighbouring Lombardia and Liguria. Perhaps these two clubs ought to look more at what is on their doorsteps? After all, the ingredients are there. The best performing area, clocking in at 15.9 players per million, is Liguria. There are not many stars -- Federico Chiesa is an exception -- but plenty of solid professionals. Perhaps the production is due to a temperate climate of mild winters and a sea breeze in summer, as well as good infrastructure and a relatively dense population, ensuring lots of competition. Campania, home to Naples, is among the best performers, despite having a substantially lower per-capita GDP. This is very much an exception, as, across the board, poorer areas tend to underperform. The other curious aspect is that while the region produced plenty of gifted players -- Fabio Quagliarella, Lorenzo Insigne, Ciro Immobile and Gigio Donnarumma spring to mind -- few came through the ranks at Napoli, the biggest local club (Insigne apart). That might be because a number of northern clubs actively scout in the area. From Sicily to Puglia, from Basilicata to Calabria, the south of Italy massively underperforms. Per-capita GDP is substantially lower here than elsewhere, and surely that is a contributing factor. Yet at the same time, Campania -- where there are similar economic conditions -- does considerably better. The impression is that the south, while equally as football-mad as the rest of the country, is generally neglected in terms of scouting. If you have an academy nearby, it is easier to train and access their coaches and facilities. In addition, Italy, like most countries, has restrictions on youngsters traveling beyond a certain radius at youth level. However, it does not seem to make that much of a difference. Wealthy areas with excellent infrastructure and multiple clubs -- Verona or the region between Bologna and Ferrara are examples -- underperform despite having plenty going for them. As well as infrastructure, the French capital has large immigrant populations. Many youngsters spend hours playing street football, often with older compatriots and in an aggressive, competitive environment. There are also many well-run youth clubs in the area. In March, 10 of the 23 players named in a national team squad came from Paris; Paul Pogba, Kylian Mbappe, N'Golo Kante were three of those. With a population of around 10 million people -- if you include suburbs -- the city was always going to be the country's leader in producing players. This Normandy city, located 90 minutes west of Paris, has a population of around 50,000, yet no fewer than eight professionals were born there, including Ousmane Dembele. Evreux has several strong clubs and is a popular location for scouts across Europe. Among the recent products are youth national team stars Rafik Guitane (18, on loan at Le Havre from Rennes) and Claudio Gomes (17, just left PSG for Manchester City). The far north, beside the Belgian border, has produced many defensive players in recent times, including centre-backs such as Raphael Varane and holding midfielders such as Yohan Cabaye. Mathieu Debuchy, Arthur Masuaku and Lucas Tousart are also from there, as are several goalkeepers. By contrast, Lyon has been a hotbed for attackers, with Karim Benzema, Nabil Fekir, Alexandre Lacazette, Olivier Giroud and Loic Remy hailing from the city and surrounding region. Of course, there are also counter-examples: Franck Ribery comes from Boulogne in the north, and Samuel Umtiti is from Lyon. Although the southwestern area has produced prolifically, not many homegrown products play for its three big clubs. Marseille, Monaco and Nice's first-team squads are full of players from farther afield. Only Boubacar Kamara and Maxime Lopez are from Marseille, for example, while there are no locals in the Monaco ranks. This suggests that, while such big clubs recruit extensively for their academies, not enough young players are making the grade with the clubs' first teams. In areas where rugby is popular, such as the southwest, plus La Rochelle and Clermont, the production of footballers is not as strong. Toulouse, for example, has a rugby team that has won four European Cups, but the city also manages to maintain a Ligue 1 football club.